Start your day with a 2-hour walking tour of Perth. See highlights such as the Perth Town Hall, the old theater district, top art galleries, and the State Buildings. Your guide provides informative commentary, along with a stop for coffee or tea, and chocolate tastings. Make your way to Perth Town Hall to meet your guide for your walking tour of Perth. 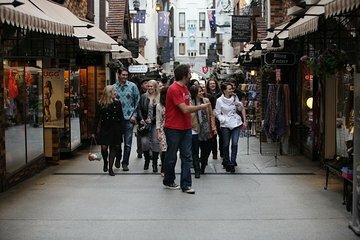 Learn about the heritage precinct of Perth as you stroll along with your informative guide. See the theater and educational districts, hidden gardens, public art, and an art gallery along the way. Take a break with a cup of coffee or tea in a renovated heritage building. Wind down your tour at the State Buildings, which historically housed the General Post Office, Land Titles Office, Treasury and Parliament. Today, the buildings are home to a hotel and a variety of eateries, including the renowned Sue Lewis Chocolatier. Sample their sweet treats as you hear about the art of making chocolate. When your tour ends, you are well positioned to visit the historic Cathedral Square and new Elizabeth Quay on your own. This was a fabulous way to spend the morning made perfect with coffee and sweets. Our guides were top-notch; very knowledgeable and friendly. They covered a good deal of information regarding history, art and current restaurants etc. I would highly recommend! My sister and I were the only 2 on the tour so we were treated to a personalised and informative tour. Leanne, our guide, was very friendly and she pointed out lots of things that we may have missed if we had been walking around by ourselves. Our tour lasted 2.5 hours and we came away feeling we had learnt a lot about the history of Perth. Leanne also suggested places to go to after our tour. Ryan was full of information, present day Perth and the history of Perth. We saw little alleys and back streets which we would certainly have missed walking on our own. A very good couple of hours. A good tour but it needs some rearranging. This was a good tour and the guide was very informative. I have given this 4 stars because of the coffee stop. About 10 minutes after the tour started we stopped for coffee. The guide took our order and we waited around for about 15 minutes for them to be prepared. When the last coffee was delivered we were up on our feet again. It was hard to walk and drink coffee at the same time so I binned it. I suggest that the coffee stop be at the end of the tour or in the middle or just do not include it at all. Ryan was not only friendly with a good sense humour, he was extremely knowledgeable of Perth city centre. We were treated to one of the best coffees I've ever had at Moana's and yummy chocolate at Nosh. It's amazing what beautiful city we live in. I came away from the tour informed and motivated to know more about our city. Great way to experience Perth for a first time visitor. Ryan our guide provided a running commentary of the history of Perth and hidden gems. Can thoroughly recommend. Highly recommend this tour of the city. Tour guide very friendly passionate and knowledgeable of the city and history of people and buildings. I enjoyed the time wandering and gaining a more wider view of the historical aspects of Perth in Australian history. This tour was a good introduction to the CBD. Our guide Emily was interested in her adopted city and had researched the history of the development of WA generally and Perth in particular. She was an enthusiastic guide and proud of what Perth had to offer the visitor. As we were the only 2 participants there was plenty of interaction with the Emily. During the tour there was good historical information given and it was wide ranging in the areas it covered. Morning tea was in a cafe housed in an old building that was adapted for a modern use.